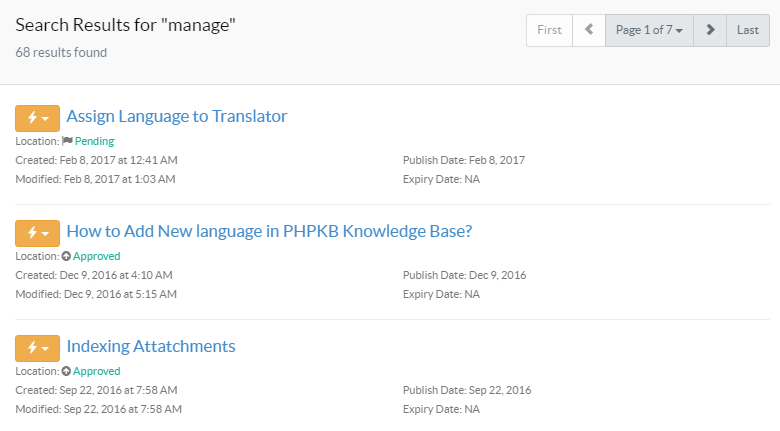 To search articles in the knowledge base, click on "Search Articles" link available under Articles section in left navigation bar. ’Search Articles’ screen displays various filters using which you can search the article. 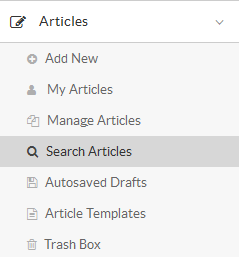 But you need to select one or more filters to search for articles. Article ID: If you know the Article ID, you can directly enter it in the text box to edit it. Keywords: Enter the keywords that you want to search and then click on ’Search’ button to view the results. Search In: You can narrow the search more by specifying where these keywords are to be searched. By default, All is selected but you can choose any of the options among Title, Content, Keywords, Summary or Custom Fields. Categories: You can search article in specific categories using a categories drop-down. All private and public categories are embedded in this drop-down. Status: You can search articles of any specific status (See:Types of Articles) using this drop-down. 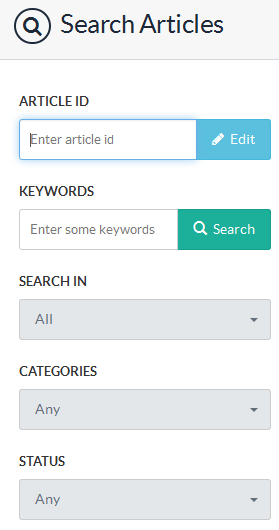 By default, Any is mentioned which will search all type of articles. Less than - Click to search for articles viewed lesser than the number you have specified. Greater than - Click to search for articles viewed more than the number you have specified. Equal to - Click to search for articles that have exactly same number of views as you specified. Less than or Equal to - Click to search for articles viewed as many times as you specified, or fewer. Greater than or Equal to - Click to search articles viewed as many times as you specified or more. 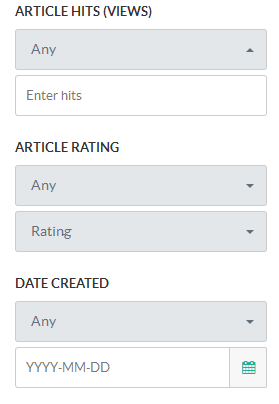 Article Rating: You can search for articles by ratings given to them by end users. Select a rating number from the Rating drop-down list and comparison options (discussed above) from comparison drop-down list. Date Created: You can also search the article according to the date on which it was if you know created. You can specify the creation date from the date calendar. Date Published: You can use this option to search for articles that are published before, after or on the date specified. Date Modified: Use this option to search for articles that were modified before, after or on the date you specify. 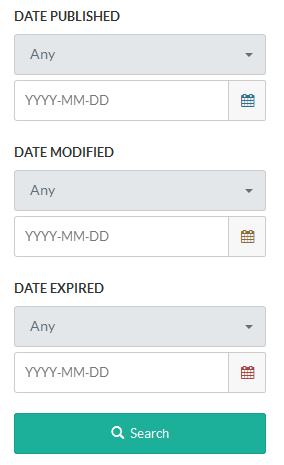 Date Expired: You can specify the expiry date to search for articles that are expired before, after or on the date specified. Click on the search button and it will display a list of results at the right side of ’Search Articles’ page as shown in the figure below. Click on article title to preview the article and to perform the article operations click on the Actions drop-down.